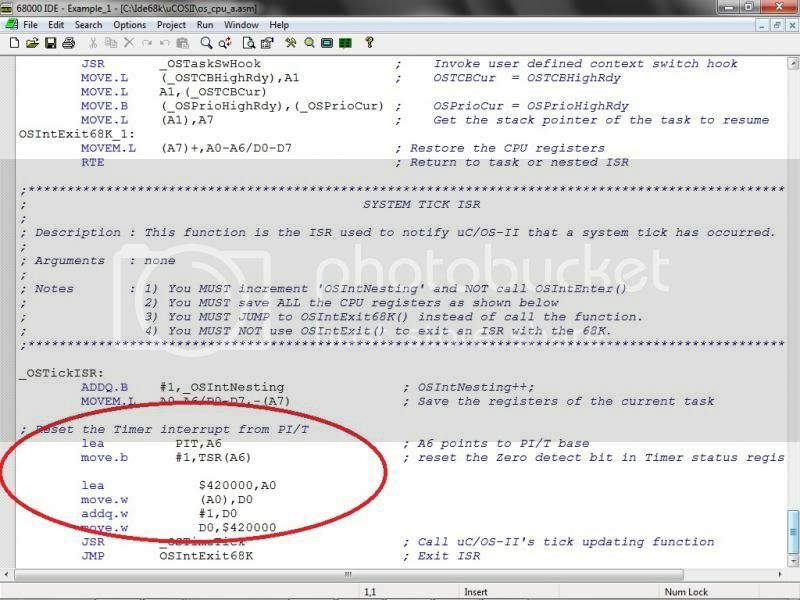 Hi - I'm looking for a windows assembler that will assemble 68020 instructions plus also be able to handle 68881/2 floating point instructions. 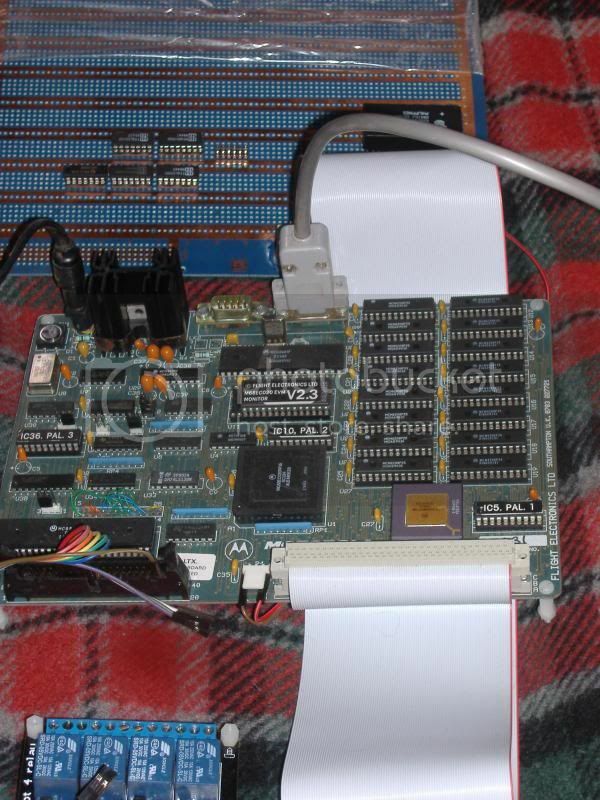 IDE68K has a C compiler, assembler and simulator capable of supporting 68020 and 6888x instructions. 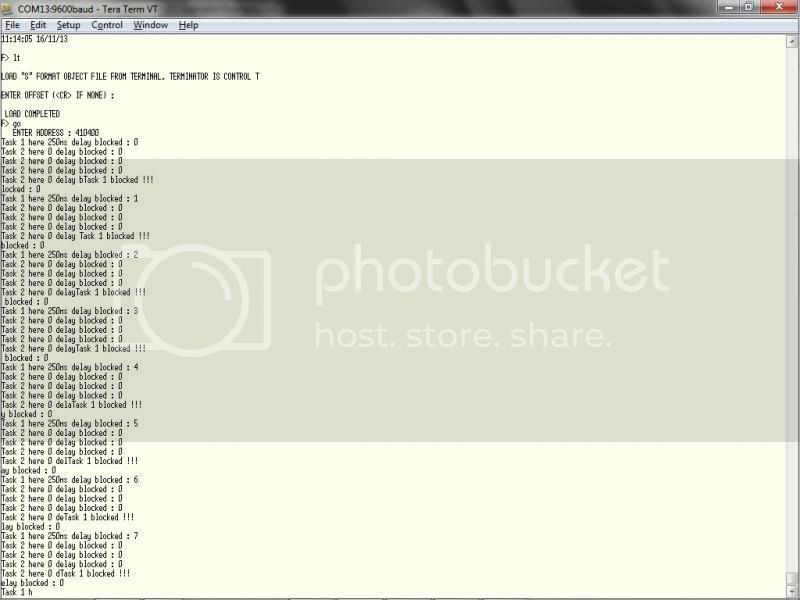 I've used this quite extensively for analyzing and optimizing some 68E020+68882 code under my management. 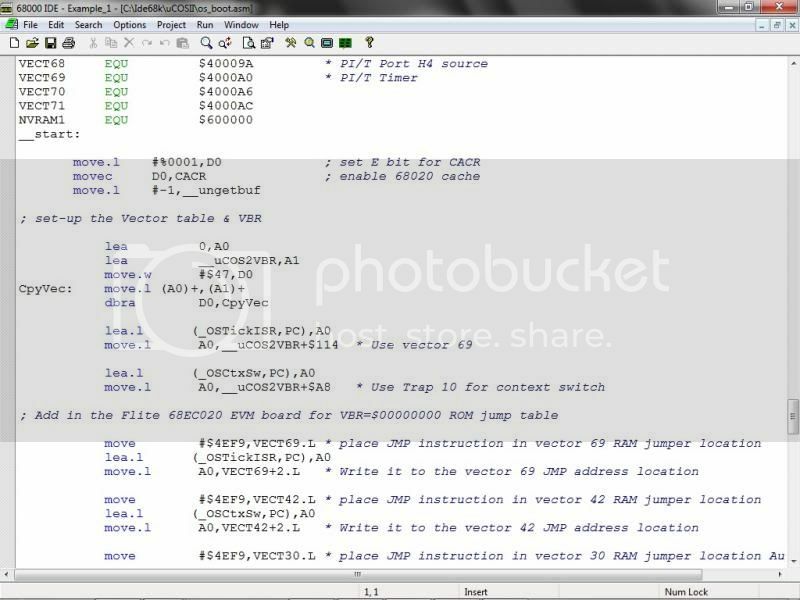 Under tools & software tab is this cross assembler, if you're a reasonably competent C programmer this can be compiled for other platforms, including the Win32 Console. 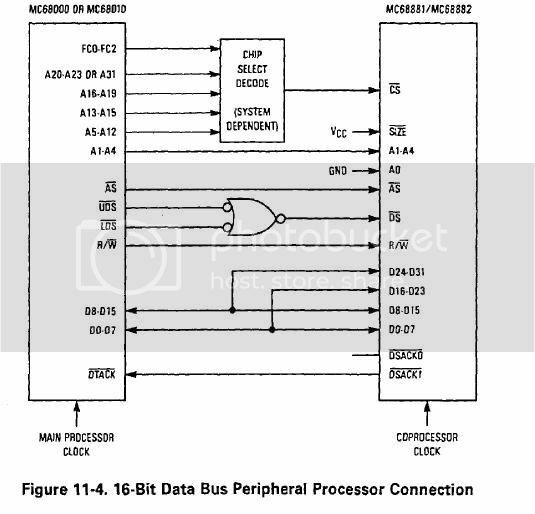 Previouly I had been planning to wire-warap a 68881 to extend my current simple 68000 development board and then implement the Motorola application notes AN947 (MC68881 FP coprocessor as a periphial in a M68000 system) which uses macros to implement the FP instructions - but this new kit will allow me to by-pass that method. 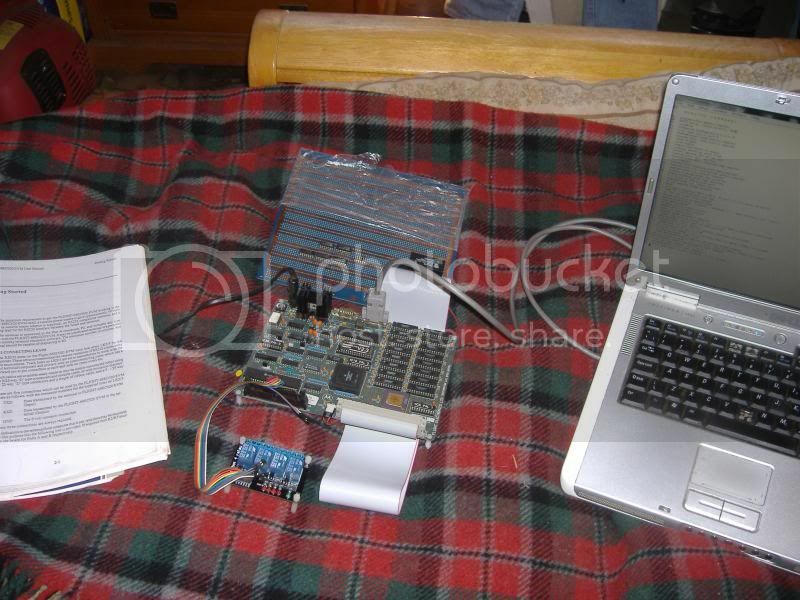 Still it was good doing the research on how to wireup a 68881 to a bog-standard 68000 system. I may still do that at some point. 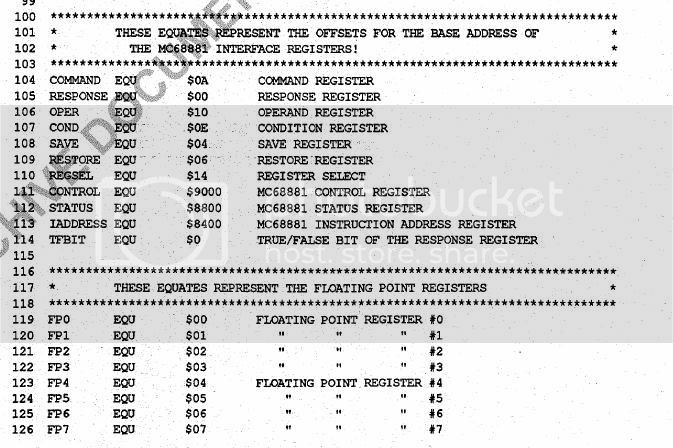 The absence of a 6888x doesn't preclude the 68000 from performing floating point in software. Attaching the 6888x to a 68000 is a bit of a hack, it works much more effectively on the 020/030 designs, and the addressing modes are so much better. Oh yes I know - I implemented an FFT algorithm in 68K assembly and 'borowed' a set of FP library routines that implemented all the FP instructions using the standard 68000 instruction set. The wire up of 68881 to a standard 68000 although not as neat as having the built-in co-processor interface like the 68020 etc - didn't look too bad a job! And then a set of macros to implement all the instructions types - the macros implement the comms with the Co-Processor directly via writes to the command register, read the response register and then do all the data transfers, if required, via the Operand register. As I say I may stilll do this little project at some point in the future. How do you communicate with it? Can't see any obvious I/O ports. 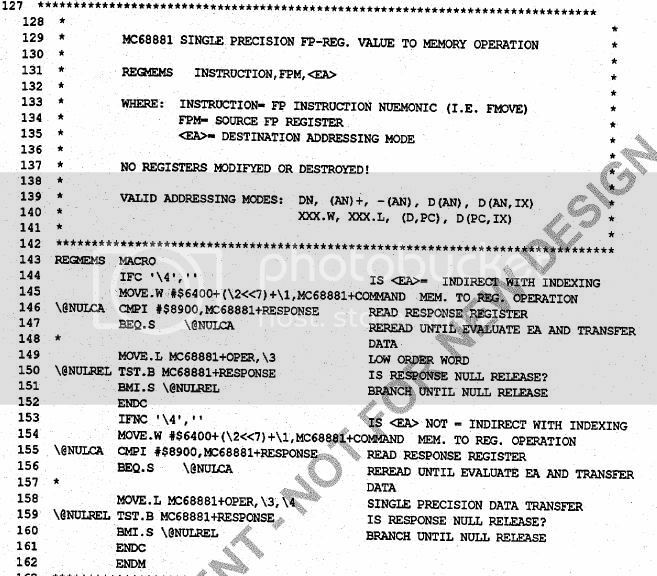 You basically memory map the device into the 68K's regular address space, but then you have to read the control/status registers from the device's coprocessor interface state machine. I'd guess this would be a relatively expensive exercise to implement in 68K instructions, although I can see the appeal in trying. The board pictured is on the back of a mezzanine stackup, the IO/PSU board connects to the header on the right, and has 3 serial ports. 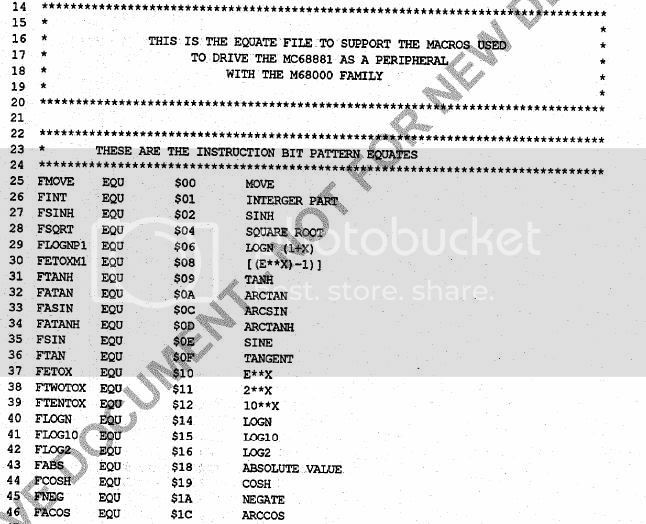 ATARI made the 6888x board for the 68K ST, 74 series chips would appear to perform decoding. How are your experiences with this Flite board? Very good, a lot of fun has been had using it. I developed C code & ASM under the IDE68K environment & use Tera Term to communicate & send the Motorola S-record file down to the board. & use the onoard monitor features to test & run it. I've extended the board by filling the 8 spare RAM sockets, so it now has 512KB. I also made up a 96way DIN connector & cable which plugs into the Flite expansion socket & the other end I have a vero board where I have wire-wrapped some DS1386 (32KB non volatile static RAM with Real time clock & watchdog timers) & I tested the interupts generated by the RTC & watchdog timer. Also written setup & IRQ handler routines for the onboard DUART & PI/T & driven some relays to switch some electric devices on/off & had the DUART IRQ reading & writting to a circular buffer in memory etc. With the coding I've incorporated some pure assembler, some C with assemler code & IRQ routines interfaced with the C main calling program. The IDE68K has a Micrium uC/OS-II (multi tasking Real time Kernel) system, & with just a few modifcations I was able to port that to work on the Flite. And have written multi tasking C systems that use all the features such as mailboxes, queues, semaphores etc etc. I was quite pleased with myself for that port. As it really gives some power to the whole system. I notice they have a TCP stack module, so I may well look at what h/w I would need to add to get that to work & then have network capability too. There is plenty of spare room left on my VERO extension board & I'm going to add a multi-channel MUX & a high speed ADC so I can do some monitoring. Chips & sockets already bought, probably be a Winter project when the nights draw in. That sounds phantastic and like everything I always wanted to do. Unfortunately I never found a board which was so close to my wishlist like this one. On this board I would be missing the MMU (for a Linux port) - but I guess I was to demanding. Today this is so "vintage" and as far as my sporadic checks show - it is very difficult to still get a board of the like. I was playing around with CPM/68k within the Easy68k Simulator some time. I was in the middle of building it, but gave up (too demanding for my toolbox.. I would be interested indeed in the details of the development environment, the tools and... some photos?! Hi hancock, here some pics of the board attached to my laptop running Tera Term via a USB serial. Here is the Terminal screen just after switching on "HE" help command output, then I ran a program that was stored in the Non volitile RAM for several months $6000020 & it looks like it the RTC has kept it time & adjusted itself for GMT too !!! 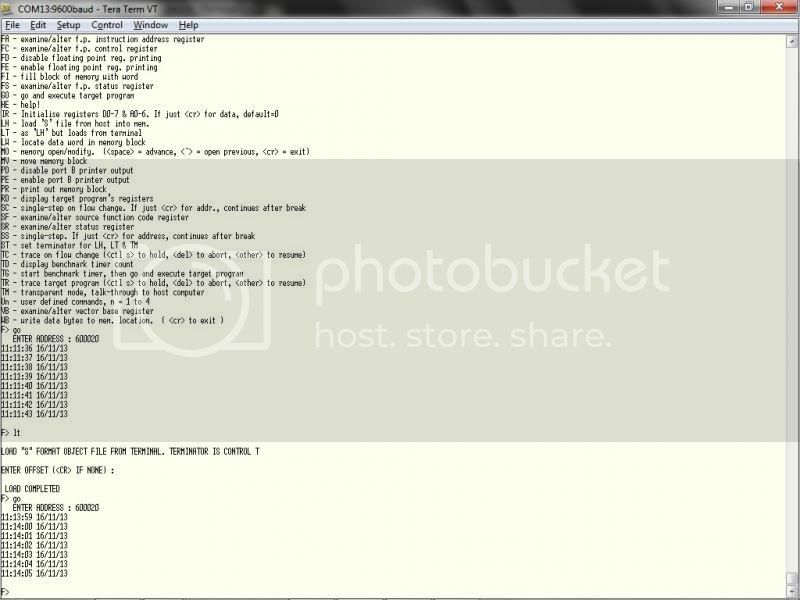 Then I downloaded a ("LT" command) a new version I coded the other night & ran that. Here I downloaded a uC/OS-II program that has 2 tasks using semephores to a gain accesses to a data object (example from chapter 1 of the uC/OS-II manual) you can see Task 1 & Task 2 being blocked or getting the resource. Very powerful kernal & only resides in ~70K so with the 512K I have, that leaves plenty of space for user tasks & ASM code. Then just the "putchar", "getchar", "kbhit" & "exit" routines which are just basically "TRAP #11 dc.w nn" type commands that apply to the Flite monitor & it was all done. Hey, thanks, nice to see the "lab". I had also thought about uCOS, but did not get that far although I am very interested in porting and Operating Systems as such. It just takes too much time...and I never could find the "ideal" board as I conceived it. Will do another try to run uCOS on one of my boards - perhaps this time I will finish it. Actually, this is why I was looking for coproc-support in Easy: perhaps I could find enough fun in the simulator and could avoid any more pains with hardware stuff. But it seems that it will not happen. If I remember correctly there *were* thoughts about supporting 68020/68881 but have not seen any concrete information. Using the RFCOMM protocol stack & the "AT command" language I think I will be able to get the aboard to communicate with my wireless BT homehub & eventually connect to the WWW. can i see your ucOS/2 port ? Sorry for the delay, I only spotted your post today & I haven't logged in for a while. 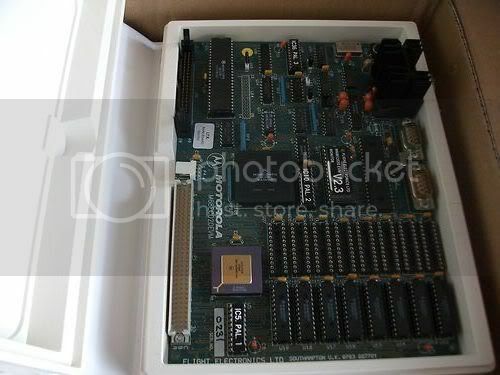 I'll dig out the code modifications that I made to the standard uC/OS-II as supplied with the IDE68K download. 1/ Change the LIB/start.asm file for the __exit, __putch, __getch & __kbhit so that they use the particular TRAP that applies to your 68020 board. Mine uses TRAP #15. 2/ Change the uCOSII/os_boot.asm so that you patch in the _OSCtxSw routine into the TARP #10 vector & the _OSTickISR routine into which ever vector your onboard timer interrupt chip uses. I have a 68230 chicp & generate the 100Hz interrupt using Vector 69.
; set-up the timer here but don't enable until after OSStart() call! Think that is basically all that I needed to do. Good luck.